For years now, the program to develop the X-37B spacecraft has been shrouded in secrecy. Originally intended as part of a NASA project to develop a reusable unmanned spacecraft, this Boeing-designed spaceplane was taken over by the Department of Defense in 2004. And while it has been successfully tested on multiple occasions, there remain some unanswered questions as to its intended purpose and what has been taking place during these flights. This, predictably, has lead to all kinds of rumors and speculation, with some suggesting that it could be a spy plane while others think that it is intended to deliver space-based weapons. It’s latest mission – which was dubbed OTV-4 (Orbital Test Vehicle-4) – has been especially clandestine. And after nearly a year in orbit, it remains unclear what the X37B has been doing up there all this time. Inspired by a book and poster from 1995, titled “Rockets of the World,” graphic artist Tyler Skrabek has provided a new and updated “clean” look for his latest work. Skrabek told Universe Today that he’s been working on this poster for 3 months, but he’s had the idea of creating it since 2012. It is available in various sizes on etsy here. He wanted an uncluttered look for his poster, and therefore used a set of rules to eliminate some rockets: The Rocket had to have more than 3 successful flights and each rocket had to be unique – no later versions from the same rocket family, such as the Soyuz. Also, rocket wannabes didn’t make the cut … not yet anyway. 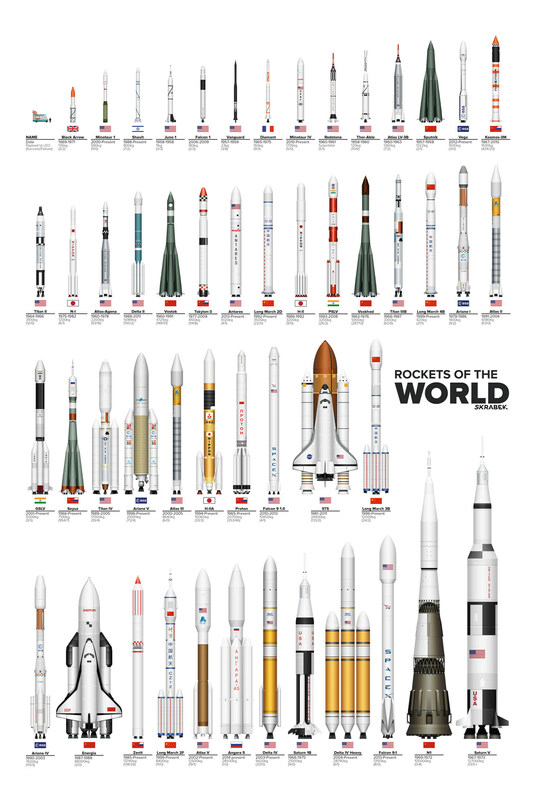 A few months ago he created the “Rockets of Human Spaceflight” poster and posted it on reddit. He took suggestions from fellow redditors to create the final version, below. He used that poster as the impetus to continue the Rockets of the World poster. 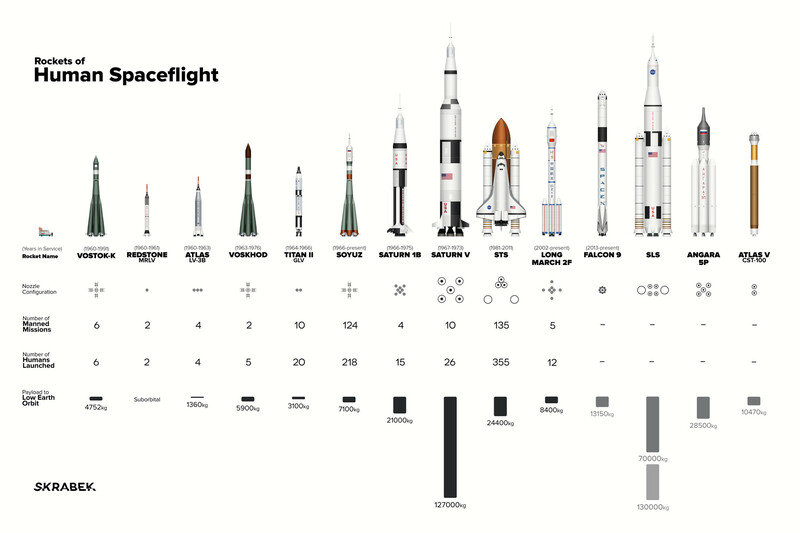 Rockets of Human Spaceflight. Credit and copyright: Tyler Skrabek. You can see the original “Rockets of the World” illustration from physics professor Peter Alway’s 1995 book “Rockets of the World” here. Tyler said he’s always been passionate about space, spaceflight and human exploration in space. You can see more of his work on his website here, including his great space infographics here. Bradbury Landing color panorama. Credit: NASA/JPL-Caltech/Malin Space Science Systems. with image editing by James Canvin. The image editing wizards at UnmannedSpaceflight are having a field day with all the sensational views being sent back by the Curiosity rover. Above is a beautiful color 360-degree panoramic view edited by James Canvin of the newly named “Bradbury Landing,” Curiosity’s landing place. The view of Aeolis Mons (Mount Sharp) is simply stunning, along with parts of (and shadows of) the rover itself. Click on the image to have access to larger views. James said he added the latest downloads from Curiosity in order to show the top of Aeolis Mons, and extended the sky to make the view complete. Here’s a view focusing on just Aeolis Mons by Stuart Atkinson at his wonderful Gale Gazette website, which highlights Curiosity’s latest explorations. He said he “boosted” the colors “just a bit, to bring out some detail.” Click on any of these images to see larger versions from Stu to see more detail — one could spend hours looking at the all the features! And presumably, the MSL science team is doing just that! Just look at this intriguing area of mesas and buttes that Curiosity will one day, hopefully be able to explore! A view of Curiosity and the first tracks left by this rover on Mars. Credit: NASA/JPL-Caltech. Now it’s time to grab your 3-D glasses to appreciate a the great view from Curiosity! Thanks to Stuart and James and all the UnmannedSpaceflight image editing wizards for providing us all a better appreciation of the location and views from Curiosity’s new science spot. We look forward to more images as they become available! You can see all the raw images straight from Curiosity here. Just as Clark had followed Lewis two centuries before. In 2004, the year Earth finally conquered Mars. To see maps of where the rovers are now, see the Mars Rover website. See more images and musings on space at the Astro0 website, and follow along Oppy’s journey at the Stu’s Road to Endeavour site. For more skillfully mastered images from the MER mission and more, visit Unmanned Spaceflight. Today, January 3, 2011, is the 7th anniversary of the Spirit rover landing on Mars. In their tradition, Glen Nagle and Stu Atkinson from Unmanned Spaceflight have teamed up to create a poster and poem combo to celebrate. The poster includes scenes from both Spirit’s and Opportunity’s adventures – Glen and Stu challenge you to see how many places you can name. Click on the images or visit Glen’s Astro0 website for higher resolution versions that you can download to print a poster or use for wallpaper. And happy anniversary to the Mars Exploration Rovers and their science and engineering teams! MER poster with poem by Stu Atkinson. Image by Glen Nagle. Click for access to higher resolution versions.